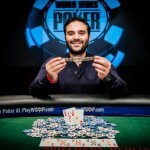 Another Greek player Pavlos Xanthopoulos, has won the event number 6 or the €3,250 No-Limit Hold’em at WSOP Europe 2015. The tournament is in process since many days at Spielbank Berlin casino. 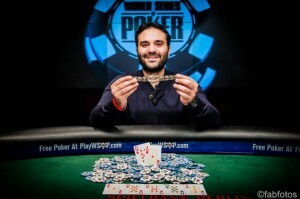 Pavlos wins his first gold bracelet at this prestigious tournament after his countrymate . Makarios Avramidis, won Event#1 of the tournament. Makarios won gold bracelet for the event named €2,200 No-Limit Hold’em Six-Handed. It means that 2 Greek players have won gold bracelets and top prizes till event#6. The total number of players/entries to this particular event was 256 in which 69 players survived and succeeded to next day of the gambling i.e. Day 2. The pool prize of for this particular event generated by all the 256 entries was €744,960 and the buy in for the event was €3,250. Here are the top players booked for top cash prizes for the Event#6 (€3,250 No-Limit Hold’em) of WSOP Europe 2015. Players like Will Failla, Allen Kessler and Asher Coniff got eliminated at the Day 3 of the gaming. They booked for 16th place, 23rd place and 24th place respectively. This was a top quality game to which Pavlos Xanthopoulos did really well till the end of the gaming. The final table was looking awesome and was filled with star poker players of the world. Pavlos was very happy indeed and did exactly what the game was required at every bit of time and step. It seems to be a great tournament going for the Greek players as they already won two gold bracelet for themselves as well as for their native country.